I am pretty sure you are aware about Google Penguin and Panda updates and may be you have heard about it that many bloggers even companies loosed their blog or website traffic in a over night, even I have read many bloggers loose their traffic by 50%. Then what is the solution for overcoming from this problem? The solution is keep updating your old blog post even in a year, it will improve ranking of your blog post, but to keep that blog visitors for life time, you have to edit the blog post with valuable content, I think it will keep your blog safe from Google Penguin and Panda Update. Which I came to know, after updating few blog post of my blog www.rehut.org, that's why I am sharing with you this information, that's why you can also get good rank in the search engine results pages, because search engine is the perfect source for getting valuable visitors to your blog. I hope you have read my blog post, which is about your blog post ranking with time, if you will update your blog post in regular basis then even you can keep your blog post on the top for every time. What to do in the Update? In the update you need to write something interesting, which you got from your experiences, which will be helpful for your blog readers, I think this is enough for your blog readers, because blog readers come to your blog for getting something new and interesting, which you need to provide, if you want that the blog reader will keep visiting your blog. What to Write New in the Old Blog Post? See, you can rewrite the whole blog post, if you think? Otherwise just add few lines, those lines you must add according the title of the blog post. What I believe, which is working for my blog as well? Will You Need to Change the Title? Title of the blog post play really important role, because if you are not giving the title name of the blog post, which title people are searching then there is very less chance that your blog post will get good position in the search engine results pages. So, if you think so, then change it. But let me help you more, there is a tool which can help you to decide that what people are searching on the web to find out, what you are providing in the blog post? If you have been in this field then may be you have heard about Brian Dean and you also may be notice that he has been able to rank for an extremely high competitive keyword Backlink, do you know what he shared? 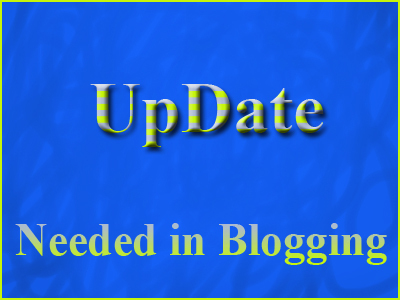 Updating blog post with new content also one of the way to improve ranking of your blog post. Well, sorry I can not share with the article not even URL of the blog, because there are many those will use reverse engineering concept to rank for the same keyword see I am making $$$ from that particular article of that blog by using this approach. So, what you need to do? Step- 3 Interlink with top ranking article of your blog, but with time interval means one interlink with variation in anchor text every three days. Step- 4 Start building links, two back links every week, and see result after just one month. Write a blog post, what you know? Read the blog post written by you as a user or reader of your blog. If you satisfy from the blog post, then I am 100% sure people those are reading your blog post, they will also satisfy from the blog post. That is really nice article. It is helpful me for the maintain my blog as live. Glad you find this blog post helpful for you. when you say that you will be safe on Penguin and Panda not just what you mean it's because you have many visitors on your blog you will be safe no! it means make sure that you have quality contents "CONTENT KING" to avoid penalized. I am not talking about lot of visitors, I am talking about how updating your old blog post can help you to get good rank on search engine. WELL, "Content is king" is a great sentence.